You have to hand it to Ghaddafi on one thing (and one thing only, mind you): the man’s vision is not easily clouded, nor upset by, any dose of reality hitherto known. His people have moved from open protests to open warfare; his troops are deserting at a steady stream as his forces lose critical city after critical city. He’s stooped to having to hire mercenaries, to pay people to fight for him. You know… when you’re a dictator, you’re expected to have a strong posse of loyal soldiers because you are The Glorious Leader, not because you have an AMEX Platinum card. It’s like hiring a prostitute to pose as your date at a social function, it fools no one and just makes you look that much more desperate. The International community has gone from expressing concern and urging restraint to openly calling for The Mighty Moe to get the %$%#@!!! out already. Both our President Obama and Secretary of State Clinton have said so, in no uncertain terms. In three separate operations against rebels today, his forces accomplished nothing. In particular, the assault on Zawiyah was a pathetic failure. wow… it’s as if Glorious Leader’s troops just don’t have it in them to cut down their fellow Libyans with automatic fire. Not all of course, there remains enough loyal pilots that bombs can and will be used. And who knows what doomsday protocols Ghaddafi might have in secret reserve. After all, it’s not uncommon for a desperate abuser, terrified at losing control, to decide “if I can’t have her, no one will!” From there it’s no great steps to murder and chemical/biological weapons on a eople perceived as treasonous to a leader who has clearly lost control of more than just his country. But the protests and rebel actions continue, and gather strength, day by day. Wow… it’s like somebody put something in the water or something. Still our Mighty Moe soldiers on, even as his country teeters on the brink of out-and-out civil war. Lacking even the foresight of Egypt’s ex-President Mubarak, Ghaddafi still claims his people love him and will gladly die in his defense. I’m sorry man, I don’t think that’s what they’re out in the streets, willing to die for. 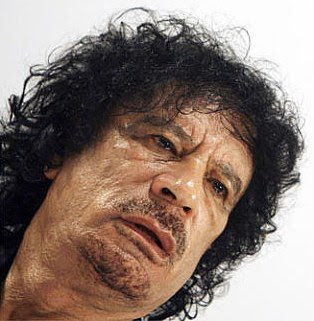 The Madness of King (Gaddafi, Kadafi, Quadaffi… oh Hell!) George. Dear Mr. Leader-of-Libya-With-a-Thousand Names. I don’t want you to take this the wrong way, but it may be time for you to consider other career options after running your little corner of Crazy World for 40 fun-filled years. It’s not your fault that, after the heyday decades of supporting terrorists, issuing proclamations, and blowing things up over Scotland, that you might be ready to move on. Actually, it is your fault, and God knows, the people of Libya are ready for you to move on. That would be the noise you hear outside your windows. those shouts and boom noises.